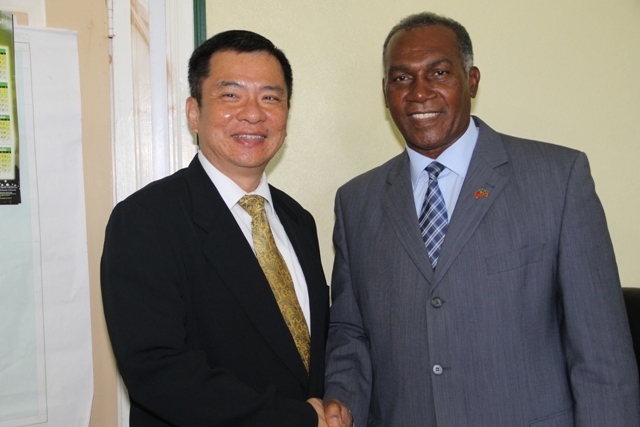 NIA CHARLESTOWN NEVIS (APRIL 10, 2015) –Resident Ambassador of the Republic of China (Taiwan) to St.Kitts and Nevis His Excellency George Gow Wei Chiou, paid a courtesy call on Premier of Nevis Hon. Vance Amory, at Nevis Island Administration building at Bath Plain on April 08, 2015. Mr Amory welcomed the Ambassador to Nevis along with his delegation of six from Taiwan. 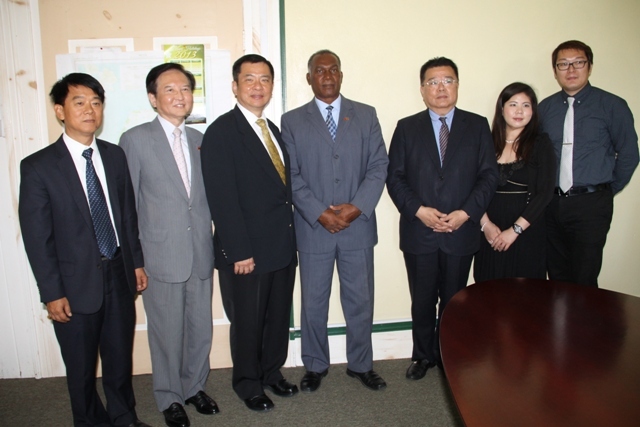 He stated that during their discussions, they spoke about the well-established relations between Taiwan and Nevis. He also thanked the Ambassador for expressing his unremitting support to the island. “His Excellency and myself spoke about the good relations we’ve had between his country and our country and also specific programmes which we have developed over the years. Primarily, we looked at agricultural development…We’ve talked of the educational system which has been given… Scholarships, which have been offered to our people for training in Taiwan,” Mr. Amory said. His Excellency Chiou expressed that the Premier made his staff and himself feel welcomed. He also stated that he looked forward to working closely with the Premier and his office. “I can feel your very warm welcome to me and my staff… we will work together…we will make your wishes for this island come true,” he said. His Excellency George Gow Wei Chiou presented his credentials to the Governor General of St. Kitts and Nevis, His Excellency Sir Edmund Lawrenceon March 25, 2015. The Taiwanese diplomat obtained his Bachelor’s in Diplomacy at the National Cheng-Chi University, where he also furthered his studies for his Masters. Throughout his career, Chiou has held positions such as Vice Consulate of the Republic China, 1st Secretary at Taipei Economic and Cultural Office in Hanoi, Vietnam and most recently Director General at the Taipei Liaison Office in Cape Town, South Africa. His delegation included Taiwan International Cooperation Development Project Manager Chang Ching Yeh, Counsellor of the Embassy of the Republic of China (Taiwan) David Y T Yu, Speedtech Energy General Manager Lucas Chiu, Director Emma Huang and Engineer Bruce Wu.